A simple 30 minute marinade is all you need for this citrus and spicy Cilantro Lime Chicken. This chicken is perfect for salads, burrito bowls, or meal prep for the week. The marinade is just 5 ingredients and only take 30 minutes to develop good flavor. Cook it on the grill for more smoky flavor or in a cast iron skillet on the stove. Have you heard of a Kamado Grill? Well neither had I until my hubby became obsessed with this grill. When I say obsessed, he was literally having dreams of this grill! Some back story on our cooking relationship, I do 90% of the cooking and my hubby grills every now and then. So when he told me he wanted to buy this grill, which isn’t very cheap, I was definitely skeptical. We ended up getting the grill and for the past 2 weeks, it has not disappoint! And the hubby is becoming quite the grill master! 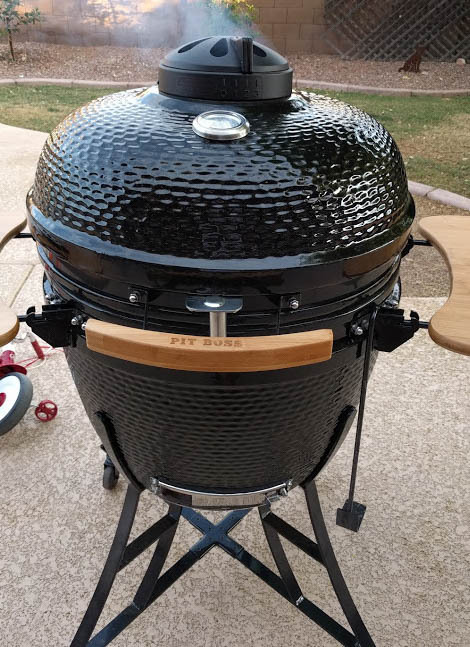 The entire grill is ceramic and uses a venting system with charcoal to control the heat. Since its ceramic it can heat up to very high temps and hold a steady heat. Everything we’ve made on the kamado has come out flavorful and juicy. This investment has paid off! We made cilantro lime chicken thighs the other night and have been eating them for leftovers the past couple of days. Nice juicy chicken with a flavorful crust. I did a quick marinade of the thighs using oil, garlic, cilantro, lime, and jalapeno. This is also my same marinade for cilantro lime shrimp. Marinate for at least 30 minutes and grill until cooked thoroughly. Remove from grill and drizzle with more marinade. A simple 30 minute marinade is all you need for this tender, flavorful, juicy chicken. Combine oil, minced Garlic, 1 lime, lime zest, chopped cilantro, chopped jalapeno, and whisk in a bowl. Reserve about 2 tbsp of the marinade to pour on the chicken after it is cooked. Add chicken thighs to marinade, combine to coat each piece and marinate in refrigerator for 30 minutes. Place chicken on grill or cast iron skillet on stove and cook till internal temp is 165 degrees. Once chicken is done, remove from grill and pour with reserved marinade prior to serving.